If it’s June, it’s the seaside. If it’s 2018, it’s Brighton. 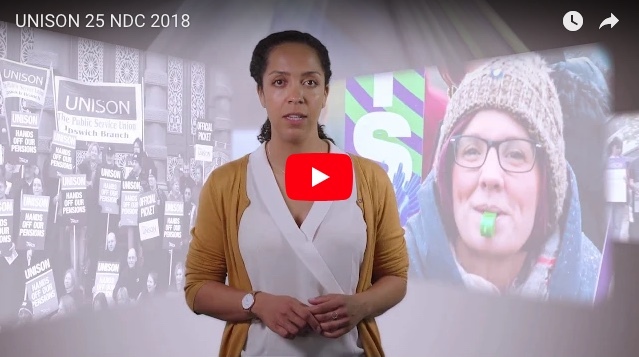 Once again, UNISON activists gathered in the south coast resort last month for our national delegate conference – the annual parliament that sets the priorities for the year ahead and decides policies for the union. And there was a special theme to this year’s conference – our 25th. Yes, UNISON was formed on 1 July 1993 and conference saw the start of our 25thbirthday celebrations. 25 years? We’re just getting started. But the conference wasn’t just about celebrating our own birthday. The issues, threats and challenges facing our members and key public services remain real and how to deal with them ran through the whole four days of the conference. Whether it’s making sure we provide greater support for members working in the private sector,the fastest growing group of members, making young workers key to organising and campaigning work, or dealing with the consequences of Brexit – the conference agenda gave delegates representing ordinary UNISON members the opportunity to discuss, and decide on, the key issues facing public service workers. 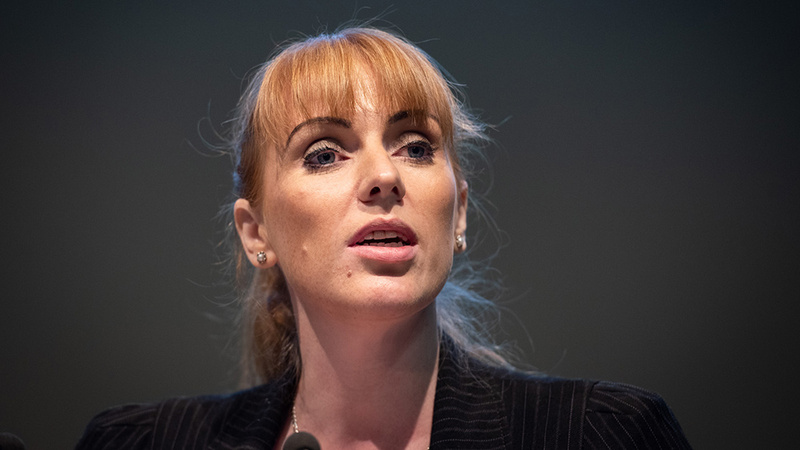 But there was also time for guest speakers, including US public service workers’ leader Dr Loretta Johnson and shadow education secretary Angela Rayner. And the end of conference saw the union’s national executive council meet to elect a new presidential team. Scottish mental health nurse Gordon McKay was elected president, with local government administrative officer Josie Bird, from Newcastle, and care worker Sian Stockham, from Abergavenny in Monmouthshire, as vice presidents. 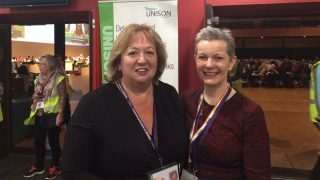 The same week also saw the annual decision-making conference in three of UNISON’s service groups: local government, energy and water, environment and transport. Away from conference bubbles, June was a big month for NHS pay. 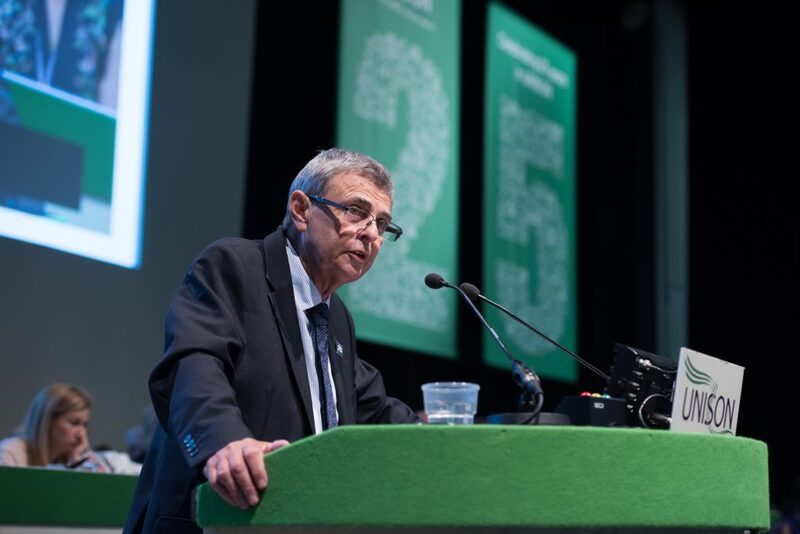 UNISON – alongside the 13 other health unions involved in NHS pay talks – consulted members in England over proposals for a three-year pay deal which would see increases of at least 6.5% over the three years. Workers who are not at the top of their pay band would see a higher pay rise through a combination of annual pay increases and faster incremental increase. The deal will also give an immediate £2,000 increase to lower-paid staff, meaning every NHS worker in England will now be paid at least £8.93 an hour (18p above the living wage of £8.75 an hour), or £17,460 a year if they work full-time. UNISON members voted in favour of the proposal by a large margin: 84% of more than 83,500 members voted to accept and 16% voted against against the offer in a turnout of around 30%. The agreement only covers the NHS in England, as health is a devolved matter, but additional funding will be going to health budgets in Wales, Scotland and Northern Ireland, making pay negotiations possible there. 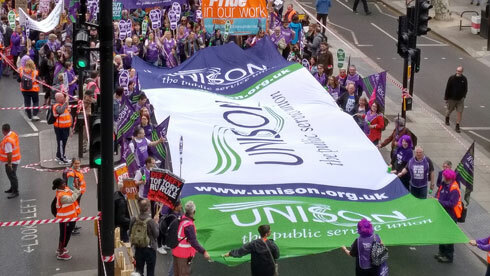 By the end of June, UNISON health members in Scotland were being consulted on their own proposals, with a minimum pay increase of 9% over three years – for staff earning less than £80,000 a year – combined with larger increments and faster progression within bands. 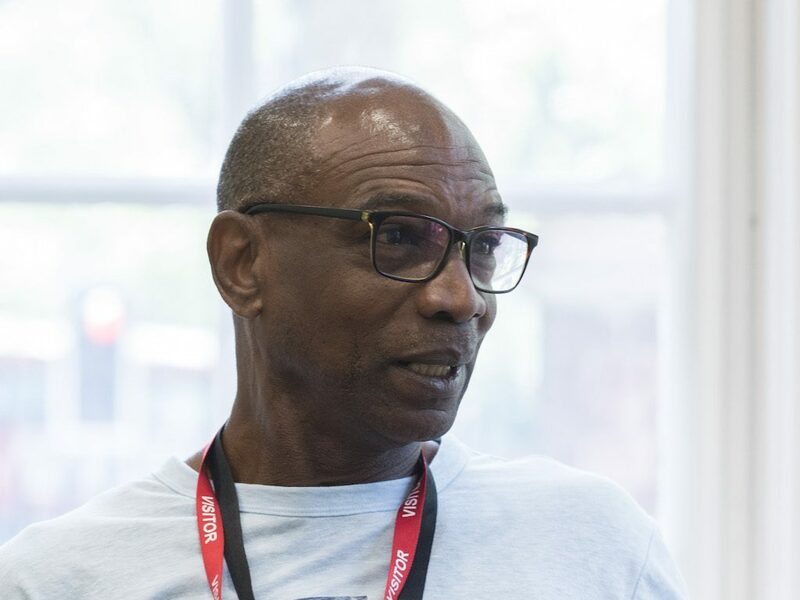 One thing which affected members’ lives in a very real and personal way was the Windrush scandal, when it emerged that the government had been threatening – and taking action against – British citizens who arrived in the country as part of the Windrush generation of post-war Caribbean migrants who helped keep public services working, and many of whose children and grandchchildren do the same to this day. One of those was UNISON member Michael Braithwaite, a school teaching assistant who lost his job due and was threatened with deportation due to the scandal. He turned to his local union contact for help, and shared his story with the union. 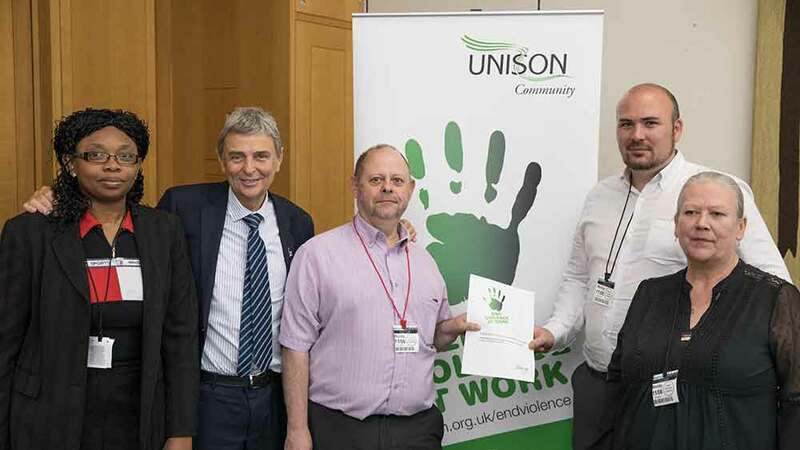 And the union made its presence felt at Westminster with the parliamentary launch of a violence at work charter for the voluntary and community sector, with MPs joining UNISON members in declaring that it is time stop the violence plaguing workers in the sector,while employers who have signed the charter and pledged to do just that added their voices. 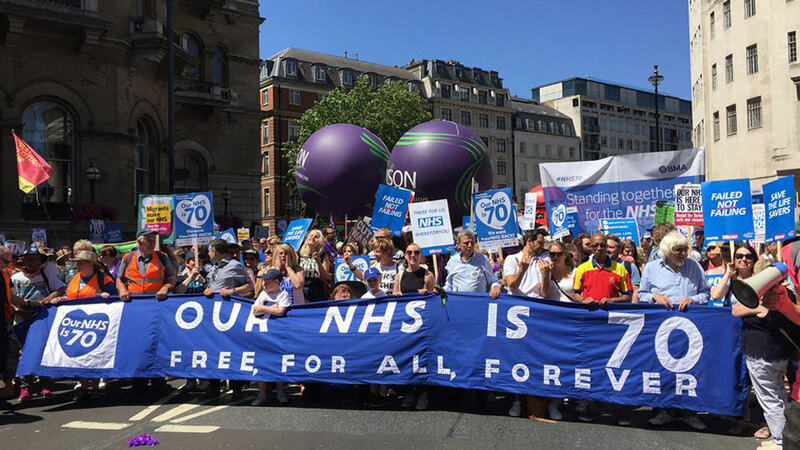 Inevitably, our members were loud and visible on the 30 June demonstrations in central London, Belfast, and across the UK to celebrate and defend the NHS as it approached its 70thbirthday on 5 July. 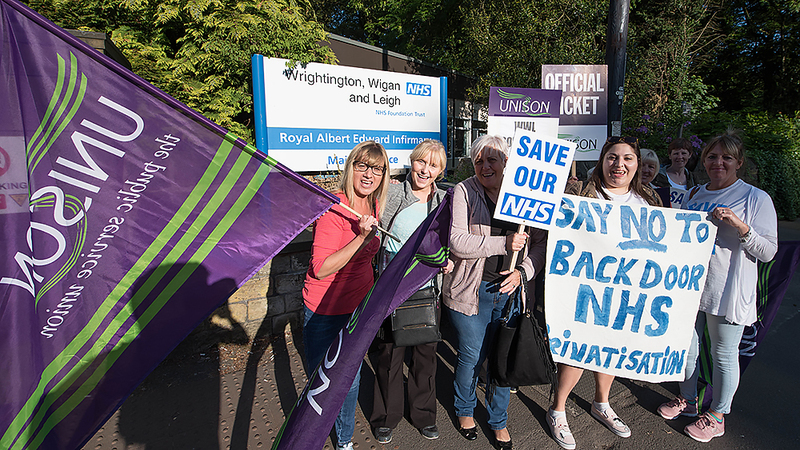 June ended with a five-day strike by health workers in Wigan against plans to outsource their work, and their jobs, a new private company, set up – and wholly owned – by the Wrightington, Wigan and Leigh trust. Under the plans, around 900 cleaning, catering, portering, maintenance and other support jobs would be transferred to the company, called WWL Solutions. Well over 500 of them are UNISON members. 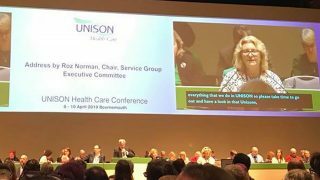 Union regional organiser Sean Gibson described the plan to set up a wholly-owned subsidiary – something being considered by other hospitals across England – as “an attack on the living standards and job security of people who live in the communities that this trust is supposed to serve. Members were adamant, recording a 89% vote for strike action in a ballot with a 79% turn-out and stating bluntly they are members of the NHS family and want to stay that way. The five-day strike was the latest in a series which began in May. Wholly owned subsidiaries in the NHS: Find out more about why the WWL members are striking. And speaking of May: that was the month which saw thousands of union members brave rain and greyness in central London to step up for public services as part of the huge TUC demonstration on 11 May.